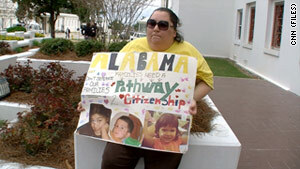 Alabama's immigration law has been the subject of many protests since it was signed in June. Washington (CNN) -- A federal judge temporarily blocked enforcement of a tough immigration law in Alabama on Monday. Opponents of the measure -- including state church leaders, the U.S. Justice Department and the American Civil Liberties Union-- had asked U.S. Judge Sharon Lovelace Blackburn to stop the law, which was scheduled to go into effect Thursday. State officials argue the law would help Alabama and not violate civil rights. In her two-page order, the judge said there was not enough time before Thursday to address all the legal arguments from various parties over the law's constitutionality. "It is hereby ordered that Act 2011-535 is temporarily enjoined, and may not be executed or enforced," wrote Blackburn. The Alabama law requires that police "attempt to determine the immigration status of a person who they suspect is an unauthorized alien of this country," according to an Alabama House of Representatives fact sheet. That provision is similar to other laws aiming to crack down on illegal immigration passed by other state legislatures over the past year. But the Alabama law also includes more expansive measures, including requiring the state to check immigration status of students in public schools. Blackburn made clear her order does not reflect on the merits of either side's legal arguments. She ordered both the state and the law's opponents to file further legal briefs in the case, and said her injunction will remain in place at least until September 29. Further appeals to higher federal courts could prevent the law from going into effect for months, even years. Alabama Gov. Robert Bentley released a statement saying, "I look forward to the judge ruling on the merits. We have long needed a tough law against illegal immigration in this state, and we now have one. I will continue to fight at every turn to defend this law against any and all challenges." During a hearing last week in Birmingham, an attorney with the Southern Poverty Law Center argued the public-school portion of the law is unconstitutional. Alabama Attorney General Luther Strange told the judge at the hearing the law would not prevent undocumented immigrants from having access to public-school education. Strange also argued that the law was not an anti-immigrant measure, and that the state welcomes visitors. Earlier this month, leaders from the Episcopal, Methodist and Catholic churches of Alabama sued the state's governor, its attorney general and a district attorney over the law, known as HB 56. One attorney representing the bishops said in court that representatives of the church did not want to become immigration agents, and that the law would make church officials targets for ministering to illegal immigrants. A U.S. Department of Justice attorney also argued the federal government, not individual states, should control immigration enforcement. Bentley signed the law in June. "Gov. Bentley campaigned on the need for a strong immigration bill," the governor's spokeswoman, Rebekah Mason, said last month. ACLU attorney Andre Segura noted that the length of Wednesday's hearing showed the complexity of Alabama's law compared with other state measures. State Sen. Scott Benson, a co-sponsor of the law, said he was pleased with how Wednesday's proceedings went. The judge was fair in her questioning, he said, adding that he is confident the law will be upheld. Alabama's law is considered the strictest in the nation. Key portions of Arizona's immigration reform law have also been blocked while a federal appeals court and the U.S. Supreme Court consider various challenges. The Alabama case is Hispanic Interest Coalition v. Alabama (cv-2484). CNN's Gustalvo Valdes contributed to this report.